Syrian forces have used chemical weapons more than two dozen times during the country's civil war, including in the deadly attack that led to U.S. air strikes on government planes, U.N. war crimes investigators said on Wednesday. "Government forces continued the pattern of using chemical weapons against civilians in opposition-held areas. In the gravest incident, the Syrian air force used sarin in Khan Sheikhoun, Idlib, killing dozens, the majority of whom were women and children," the report said, declaring it a war crime. The attack was previously identified as containing sarin, an odourless nerve agent. But that conclusion, reached by a fact-finding mission of the Organization for the Prohibition of Chemical Weapons (OPCW), did not say who carried it out. 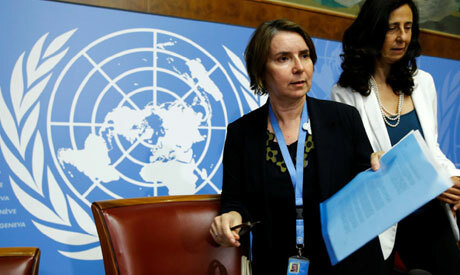 In all, U.N. investigators said they had documented 33 chemical weapons attacks to date. Twenty seven were by forces of the government of President Bashar al-Assad, including seven between March 1 to July 7. Perpetrators had not been identified yet in six early attacks, they said. The Assad government has repeatedly denied using chemical weapons. It said that its strikes in Khan Sheikhoun hit a weapons depot belonging to rebel forces, a claim dismissed by the U.N. investigators.